Yaletown may have a lock on "Most Likely to Succeed," but Kitsilano is a serious competitor for Vancouver's "Most Popular" neighbourhood. Even if you don't live in Kits-as it's called locally-you go to Kits. You go to Kits Beach, to Kits Pool, to the museums in Vanier Park, to West 4th Ave to shop and eat. If you're lucky enough to live in Kits, you get to enjoy all this-plus the fabulous location bonus of being minutes from downtown or UBC-all within an easy distance of your front door. Named for Khatsahlanough, a Squamish Nation chief, Kitsilano's storied past includes being a hippie and counterculture haven in the 1960’s and 70’s and the home of both Greenpeace, founded in 1975, and the BC Green Party, founded in 1983. Today’s Kits is a combination of the eco- and hippie-spirit of its past and 21st century gentrification, emblematized in the neighbourhood’s organic markets, multicultural restaurants, and shops like Lululemon, Vancouver’s famous yoga-wear chain, which opened its first store here in 1998. Kitsilano is situated along the coast of English Bay. It’s bordered by Alma St. to the west, Burrard St. to the east, and 16th Ave to the south. Kits restaurants rival downtown Vancouver's for variety and popularity. West 4th Avenue favorites include the Mexican Las Margaritas and the vegetarian Naam, as well as up-and-coming Fable, one of the city's top farm-to-table restaurants. On West Broadway, there's the Malaysian Banana Leaf, a local favourite. For beach goers, you can dine right on Kits Beach at The Boathouse. In addition to restaurants, West 4th Avenue is also one of Vancouver’s great urban shopping streets, with boutiques, big name-brand stores (including Lululemon), sporting goods, and home décor shops galore. Kitsilano Beach is an idyllic stretch of sand along English Bay facing the North Shore mountains and open sea. Packed with locals and tourists in the summer, the beach is the spot for sunbathing, swimming, beach volleyball, dog-walking, and socializing. Of the 15 city parks in Kits, Vanier Park is the most famous. Located at the edge of English Bay, the park has stunning views of downtown Vancouver, as well as grassy fields, ponds and walking paths. Kitsilano's Vanier Park and the adjacent Hadden Park are home to three of the city's most popular attractions: the Museum of Vancouver, dedicated to showcasing the natural and cultural history of the Vancouver region, the H.R. MacMillan Space Centre, an astronomy museum complete with planetarium and observatory, and the Vancouver Maritime Museum. 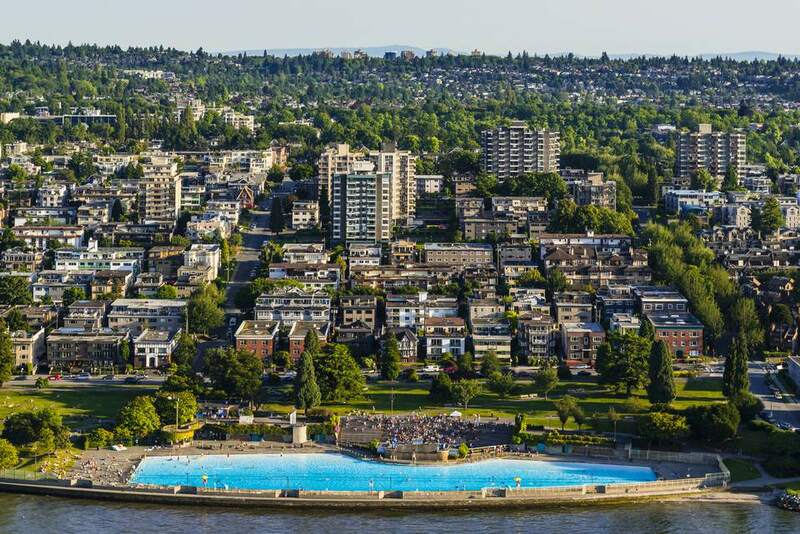 Kits is also home to the grandest outdoor pool in Vancouver. At 137 metres (150 yards), Kits Pool is Canada's longest pool-almost three times longer than an Olympic pool-and Vancouver's only heated salt water pool. Open from mid-May to September and located right on the water, between Yew St. and Balsam St., the pool boasts postcard-perfect scenic views and some of the best people watching in the city. What Is It Like to Live in Vancouver's Fairview Neighborhood?